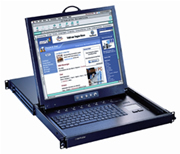 MODEL# W19PC0, LCD console KVM. 1U Rackmount, 19" widescreen LCD Monitor (TFT/ LCD active matrix color, Resolutions - 1440 x 900) with Keyboard and Mouse (Touch-Pad). combo KVM cable (PS/2 and USB) and rail set included.